Just 13 hours after his confirmation as U.S. Secretary of State Mike Pompeo was on a plane to Brussels to meet with members of NATO. Pompeo was quick to note the relevance of the choice for his first stop. "The work that’s being done here today is invaluable," he said. "Our objectives are important and this mission matters an awful lot to the United States of America. The president very much wanted me to get here." Donald Trump's earlier provocative comments about NATO had led some to doubt the US role in the organisation. But a shared concern about Russia appears to be the reason behind the trip. 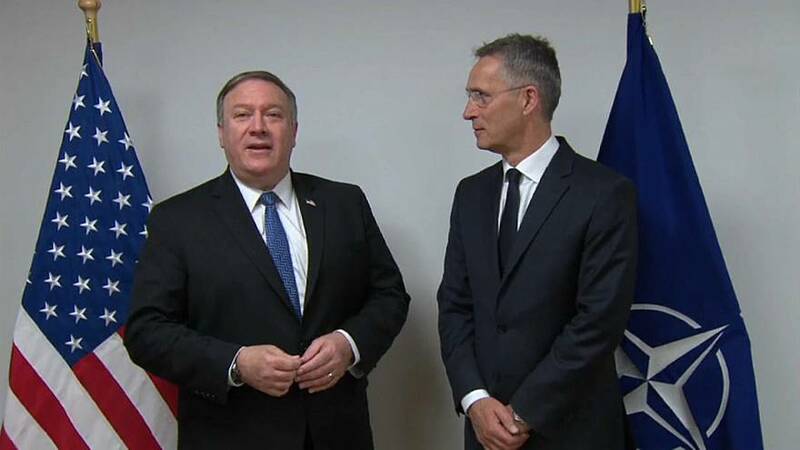 NATO Secretary General Jens Stoltenberg told reporters: "We are not in the old Cold War, but we are neither in the strategic partnership we tried to build after the Cold war. "So this is something new. And therefore it is even more importantant to combine. To be firm. To be strong. But at the same time to keep the channels for dialogue open." Although NATO members may agree on the threat presented by Russia they don't necessarily agree on spending. euronews' reporter Damon Embling says the swift arrival of Mike Pompeo at NATO in Brussels will be seen as highly significant by European allies. His words of support for the alliance are a boost after Donald Trump's early rebuke and his appearance in Brussels comes ahead of a July summit where NATO leaders are set to agree a stronger deterrent to Russia; a country Washington has firmly in its sights.